Notably, the IMF and EU governments, among them Germany, demand instead that Greece sell off its valuable ports and public companies, among them of course, Greek state oil companies, to reduce state debt. Under the best of conditions the asset selloffs would bring the country perhaps €50 billion. Plans call for the Greek state-owned natural gas company, DEPA, to privatize 65% of its shares to reduce debt. Buyers would likely come from outside the country, as few Greek companies are in a position in the crisis to take it. One significant problem, aside from the fact the IMF demands Greece selloff its public oil interests, is the fact that Greece has not declared a deeper exclusive economic zone like most other countries which drill for oil. There was seen little need until now. An Exclusive Economic Zone (EEZ) gives a state special mineral rights in its declared waters under the Third United Nations Convention on the Law of the Sea (UNCLOS), which came into force in November 1994. Under UNCLOS III, a nation can claim an EEZ of 200 nautical miles from its coastline. According to a report from Greek political analyst Aristotle Vassilakis published in July 2011, Washington’s motive for pushing Greece to join forces with Turkey on oil and gas is to force a formula to divide resulting oil and gas revenues. According to his report, Washington proposes that Greece get 20% of revenues, Turkey another 20% and the US-backed Noble Energy Company of Houston Texas, the company successfully drilling in the Israeli and Greek offshore waters, would get the lion’s share of 60%. Cyprus is a complicated piece of real estate. In the 1970’s as declassified US Government documents recently revealed, then-US Secretary of State Henry Kissinger actively encouraged and facilitated arms to the Turkish regime of Kissinger’s former Harvard student and then- Prime Minister Bulent Ecevit, to stage a military invasion of Cyprus in 1974, in effect partitioning the island between an ethnically Turkish north and an ethnically Greek Republic of Cyprus in the south, a division which remains. The Kissinger strategy, backed by the British was believed intended to create a pretext for a permanent US and British military listening post in the eastern Mediterranean during the Cold War. Today the ethnically Greek south, where Noble has discovered large gas deposits, is a member of the EU. Its President, Demetris Christofias, is the only national leader in the European Union who is a communist. He is also a close friend of Israel, and of Russia. In addition, he is a major critic of American foreign policy, as well as of Turkey. Turkish-Israeli relations, once quite friendly, have become increasingly strained in recent years under the Erdogan foreign policies. Ankara has expressed concern about Israel's recent ties with its historic antagonists, Greece and the Greek side of Cyprus. Turkey's ally the Turkish Republic of Northern Cyprus, fears it could miss out on its fair share of the gas after Israel and Nicosia signed an agreement to divide the 250 kilometers of sea that separate them. Ioannis Michaletos, Greek Companies Step Up Offshore Oil Exploration—Large Reserves Possible, December 8, 2010, accessed in http://www.balkanalysis.com/greece/2010/12/08/greek-companies-step-up-offshore-oil-exploration-large-reserves-possible/ . Hellas Frappe, Hillary came to Greece to seal oil exploration deals!, July 21, 2011, accessed in http://hellasfrappe.blogspot.com/2011/07/special-report-hillary-came-to-greece.html . John Daly, Greece Considering Plugging Aegean Islands into Turkish Energy Grid, 22 November 2011, accessed in http://www.businessinsider.com/greece-considering-plugging-aegean-islands-into-turkish-energy-grid-2011-11 . United Nations, United Nations Convention on the Law of the Sea of 10 December 1982: PART VI: CONTINENTAL SHELF, Article76, Definition of the continental shelf , accessed in http://www.un.org/depts/los/convention_agreements/texts/unclos/part6.htm . 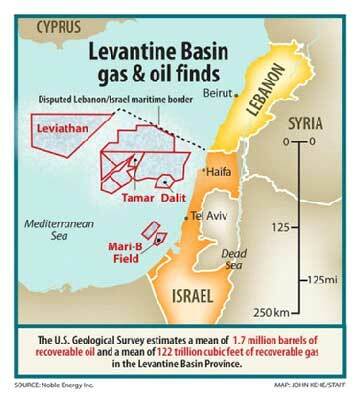 Hugh Naylor, Vast gas fields found off Israel’s shores cause trouble at home and abroad, January 24, 2011, accessed in http://www.thenational.ae/news/world/middle-east/vast-gas-fields-found-off-israels-shores-cause-trouble-at-home-and-abroad#full . Noble Energy Press Release, Significant Natural Gas Discovery Offshore Republic of Cyprus, December 28, 2011, accessed in http://www.maritime-executive.com/article/significant-natural-gas-discovery-offshore-republic-of-cyprus . Larisa Alexandrovna and Muriel Kane, New documents link Kissinger to two 1970s coups, June 26, 2007, accessed in http://rawstory.com/news/2007/Intelligence_officers_confirm_Kissinger_role_in_0626.html . Yilan, Cyprus conflict defies ready solution, May 30, 2011, accessed in http://turkeymacedonia.wordpress.com/2011/05/30/cyprus-conflict-defies-ready-solution/ . Stephen Blank, Turkey and Cyprus Gas: More Troubles Ahead in 2012, Turkey Analyst, vol. 5 no. 1, 9 January 2011, accessed in http://www.silkroadstudies.org/new/inside/turkey/2012/120109B.html .